7/30/16 EVENT! Featured Readings by Dammit Authors Amanda Roskos and Seth Roskos at 61C Cafe (1839 Murray Avenue, Squirrel Hill-Pittsburgh) on Sunday, July 31 @ 6:30 p.m.
7/10/16 EVENT! 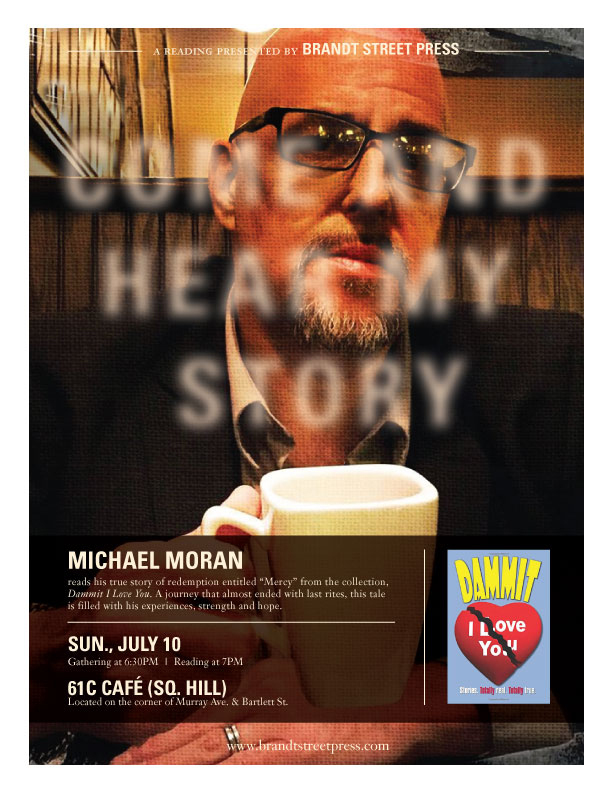 Featured Reading by Dammit Author Michael Moran at 61C Cafe (1839 Murray Avenue, Squirrel Hill-Pittsburgh) on Sunday, July 10 @ 6:30 p.m.
6/3/16 EVENT! Book Kickoff & Featured Reading by Dammit Author Bari Benjamin at Panera Bread (3401 Blvd of the Allies, Oakland) on Friday, June 3 @ 6:30 p.m. Come hear Bari read and discuss "So What Is Unconditional Love Anyway?" 6/8/15 EVENT! 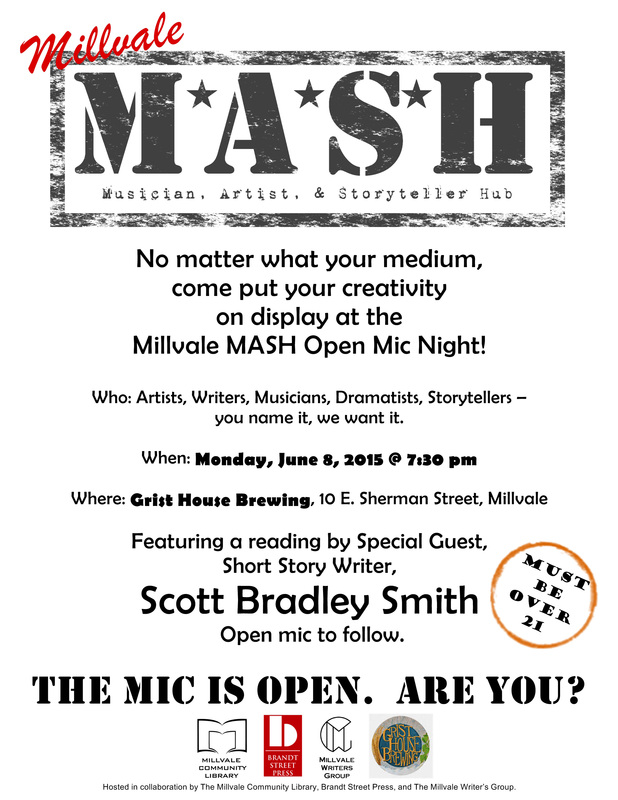 Featured Reading by Dammit Author Scott Bradley Smith at the Millvale MASH @ Grist House Brewing (10 E. Sherman Street, Millvale, PA 15209) on Monday, April 13 @ 7:30 p.m. 21 and over event. Come hear Scott read and discuss a short story. For more information, click here. 4/13/15 EVENT! Featured Reading by Dammit Author Anita Kulina at the Millvale MASH @ Grist House Brewing (10 E. Sherman Street, Millvale, PA 15209) on Monday, April 13 @ 7:30 p.m. 21 and over event. Come hear Anita read and discuss "Accounts Receivable." For more information, click here. 2/09/15 EVENT! 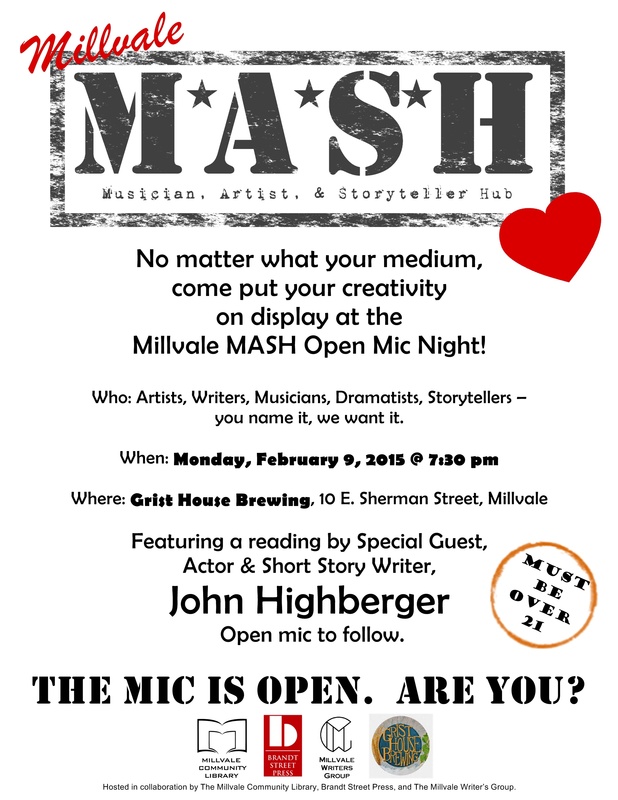 Featured Reading by Dammit Author John Highberger at the Millvale MASH @ Grist House Brewing (10 E. Sherman Street, Millvale, PA 15209) on Monday, February 9 @ 7:30 p.m. 21 and over event. Come hear John read and discuss "Becoming My Mother." For more information, click here. 12/08/14 EVENT! 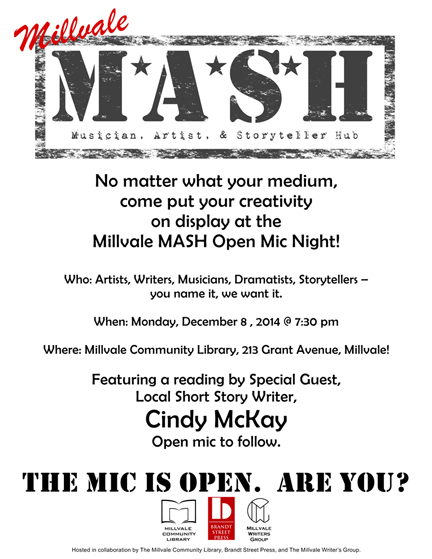 Featured Reading by Dammit Author Cindy McKay at the Millvale MASH (Millvale Community Library), Monday, December 8 @ 7:30 p.m., 213 Grant Avenue, Millvale, PA 15209. Come hear Cindy read and discuss "The Interruption." For more information, click here. 11/17/14 EVENT! Featured Reading by Dammit Author Laura Lind at the Carnegie Mellon University Bookstore (5032 Forbes Ave., Pittsburgh, PA), Monday, November 17 @ 5 p.m. Come hear Laura read and discuss "Mentor in the Dark." 11/10/14 EVENT! 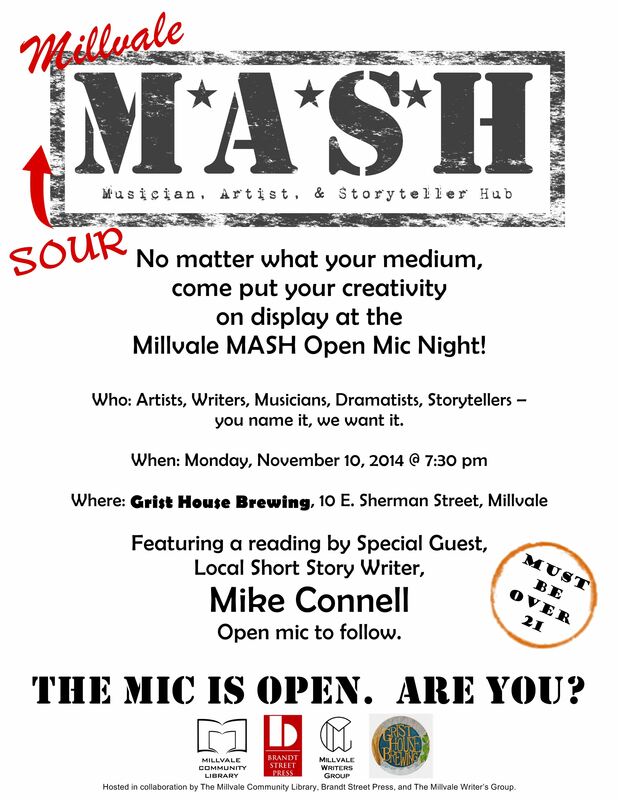 Featured Reading by Dammit Author Mike Connell at the Millvale MASH @ Grist House Brewing (10 E. Sherman Street, Millvale, PA 15209) on Monday, November 10 @ 7:30 p.m. 21 and over event. Come hear Mike read and discuss "Honor." For more information, click here. 10/13/14 EVENT! 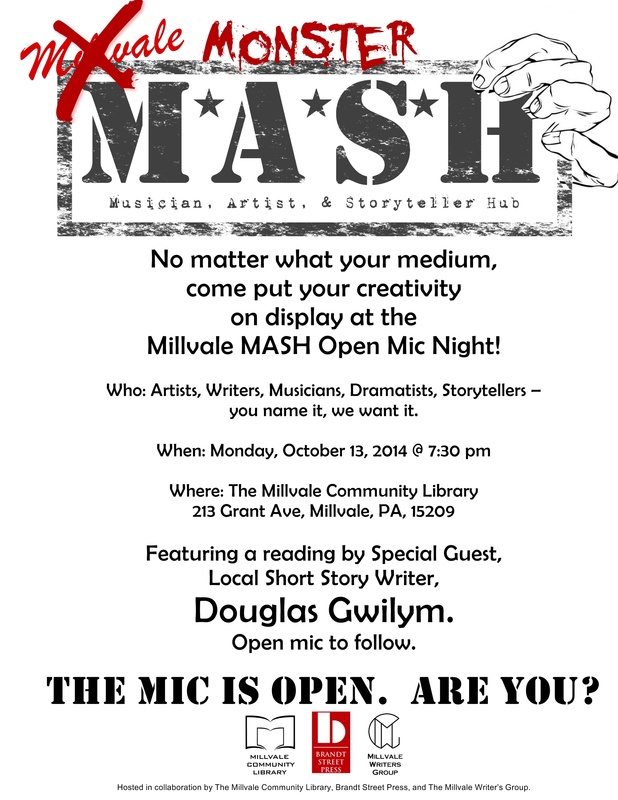 Featured Reading by Dammit Author Douglas Gwilym at the Millvale MASH (Millvale Community Library), Monday, October 13 @ 7:30 p.m., 213 Grant Avenue, Millvale, PA 15209. Come hear Douglas read and discuss "The Offer." For more information, click here. 9/21/14 EVENT! Featured Reading by Dammit Author Scott Bradley Smith at the Lynden Gallery (117 South Market Street, Elizabethtown, PA), Sunday, September 21 @ 2 p.m. Come here Scott read and discuss "Motor Men." For more information, click here. 9/08/14 EVENT! 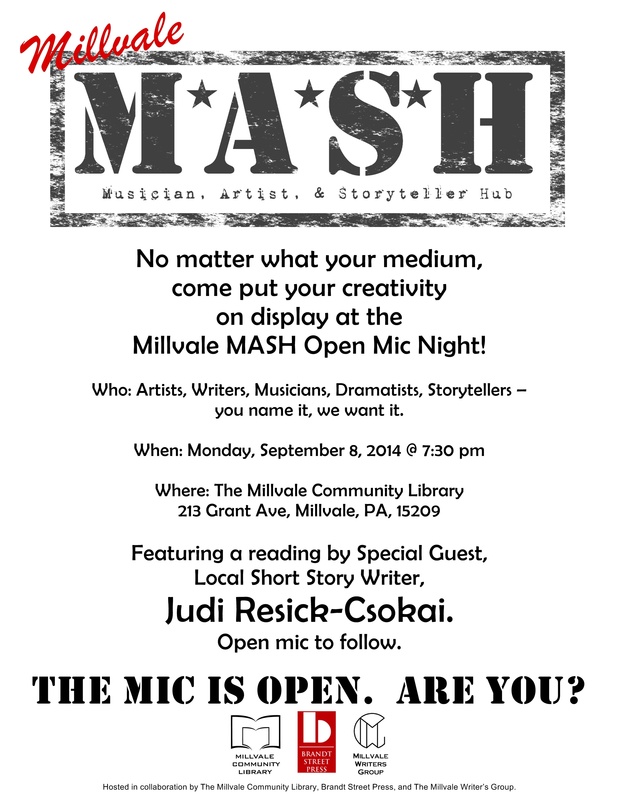 Featured Reading by Dammit Author Judi Resick-Csokai at the Millvale MASH (Millvale Community Library), Monday, September 8 @ 7:30 p.m., 213 Grant Avenue, Millvale, PA 15209. Come here Judi read and discuss "Steel Town Dancing Queen." For more information, click here. 7/10/14 EVENT! Publisher Interview at Entrepreneurial Thursday Happy Hour, July 10, 6:30 p.m., CJ's in The Strip District, Pittsburgh, hosted by jazz recording artist Jessica Lee, with music from 5:30- 8 p.m. No cover. 5/27/14 NEWS! Dammit, I Learned a Lot from That Son-of-a-Gun; 8 Pittsburgh Authors On Hand to Launch Book! EVENT! Book Launch Party! 6–7:30 p.m. @ Hough's Taproom and Brewpub, 563 Greenfield Avenue, Pittsburgh PA. Meet authors and buy a book!